People in South Korea and Taiwan unveiled monuments and staged protests on Tuesday to mark Japan’s wartime use of “comfort women”, a euphemism for girls and women forced to work in Japan’s wartime brothels. In South Korea, a new monument was unveiled as part of its first “Memorial Day for Japanese Forces’ Comfort Women Victims,” which threatens to exacerbate a sensitive diplomatic issue with Japan, South Korea’s neighbour and a key ally of the United States in efforts to contain North Korea. “My hope is that this issue will not lead to a diplomatic dispute between South Korea and Japan. I also do not think that this will be solved by a bilateral diplomatic solution,” South Korean President Moon Jae-in said in commemoration of the day. Moon said the issue involves “the entire world” and human rights of women as a whole, and pledged the South Korean government will respect the women as the main parties of the issue, and pursue commemorative projects to restore their honor and dignity including discovery, preservation and propagation of records. Japan has said the issue was resolved by a 2015 deal, struck by a previous, conservative South Korean administration, under which Japan apologised to the victims and provided 1 billion yen ($9.03 million) to a fund to support them. Tokyo has protested over other existing monuments in South Korea dedicated to comfort women, including one in front of the Japanese embassy in Seoul, as well as the move late last year to establish a day to remember comfort women. August 14 was chosen because on August 14, 1991, South Korean comfort woman victim Kim Hak-sun became the first to give a public testimony about her experience, according to the country’s Ministry of Gender Equality and Family. A think-tank funded by the South Korean government devoted to researching the issue also opened earlier this month. The comfort women issue has been a regular cause for contention between Japan and neighbours including China and North and South Korea since the war. 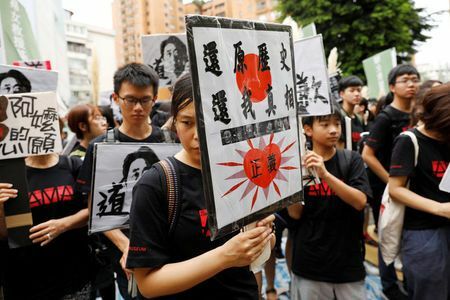 On Tuesday morning, over 50 activists joined a sit-in protest in front of Japan’s de facto embassy in Taiwan’s capital, Taipei, asking for a formal apology and demanding monetary compensation for Taiwanese who were forced to work in its wartime brothels. “Japanese government should apologise,” the crowd shouted, wearing black shirts with their faces covered by white masks. A bronze statue symbolising comfort women was also unveiled in the southern Taiwanese city of Tainan on Tuesday morning, according to Taiwan’s leading newspaper United Daily News. The unveiling, attended by former President Ma Ying-jeou, was organised by a local group and had nothing to do with the city government, an official from Tainan’s Department of Information and International Relations told Reuters. Japan colonised the Korean peninsula between 1910 and 1945 and occupied parts of China before and after the war. Japan says the matter of compensation for the South Korean women was settled under a 1965 treaty. It says that in 2015, it agreed to provide the funds to help them heal “psychological wounds”.